Formerly known as HP Pavilion and San Jose Arena. Home of the San Jose Sharks. The nearest station is San Fernando Station, which is located a block south of the SAP Center on San Fernando Street at Delmas Street. 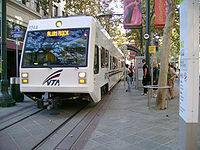 This station is normally served by Mountain View - Winchester line with direct service from Campbell, Downtown San Jose, North Santa Clara and Mountain View. VTA now provides special light rail trains from Santa Teresa and South San Jose directly to San Jose Diridon Station before (and return service after) Sharks home games. If special service is not available, riders on the Alum Rock - Santa Teresa line can transfer to trains at Convention Center Station (San Jose), or simply get off at Santa Clara Station in downtown San Jose and walk west for 1/2 mile on Santa Clara Street to SAP Center. Riders are encouraged to use Clipper or purchase 8-hour excursion pass to avoid lines to buy tickets after the event. The nearest stop for Amtrak and Altamont Corridor Express is San Jose Diridon Station. Neither provide special service for SAP Center events. 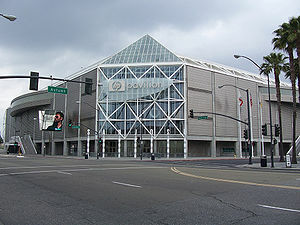 SAP Center is located one block north of Caltrain's San Jose Diridon Station. There's no special service to the games, but Caltrain may delay train #197 and #451 up to 15 minutes after Sharks games. BART riders can transfer to VTA 181 bus at Fremont Station or Caltrain at Millbrae Station to get to SAP Center. VTA lines 22 and 522 stop on Santa Clara Street by SAP Center. All other buses stop at the nearby San Jose Diridon Station. Immediately after Sharks home games, line 22 buses will stop at San Jose Diridon Station because of road closure on Santa Clara St. This page was last edited on 24 August 2018, at 19:46.